Vutec Corporation has revealed a complete expansion of new products, 5 year warranty and brand positioning for Vutec’s luxury brand Vision X. The growth of customized projection screens reflects the expanded product line and advancement of the company. Each Vision X projection screen is custom built in the company's factory and only sold directly to the integrator. 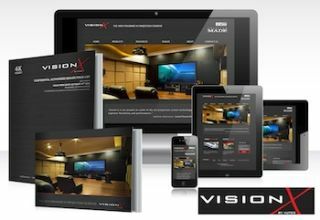 Vision X is protected from online distribution and includes a dealer incentivized VIR program. “The significance of Vision X symbolizes Vutec's strong customer focus and continued commitment to our dealers with new methods of brand interaction,” said Mike Palmisano, director of marketing and communications. Vutec’s marketing team has built and designed in-house an entirely new Vision X platform with a refreshed visual design. Consisting of the new Dealer Price Guide containing 4,000+ part numbers, custom Catalog featuring the new complete Vision X product line and the development of a dedicated responsive website designed to visually optimize across all smart phones and tablets. “As integrators and consumers turn to mobile devices for Internet browsing and content consumption, the thought behind creating a responsive website that optimizes to their device allows integrators to view our products on multiple platforms, at any time,” said Mike Palmisano, director, marketing and communications. As technology evolves, Vutec’s goal is to simplify its selling process and create positive experiences for its customers. This brand overhaul will follow with an ad campaign to support dealer growth.